Scarves are so much more than a way to keep your neck and face warm when the cold winds start to blow. Whether you're heading to yoga class or you're going out for a special dinner, scarves are perfect accessories for complementing your wardrobe. Scarves can class up your jeans and favorite tee, or they can just give you a little extra bit of cuteness for those days you want to be comfortable and stylish. With your fluffiest, softest scarf, wrap it around your neckline, and tuck the ends in the middle loops to keep them from falling out. If you like to wear fitted pants and a blouse for work, you won't want your scarf to be tied in an infinity fashion. Instead, use a yacht knot. This lets the collar of your shirt stay visible and keeps your look tailored and chic for the perfect office attire. For shorter scarves, the French knot is a tried and true style. Just wrap the scarf around your neck so the ends hang down your back, then loosen the loops and tie two knots. Scarves that are too small to tie can be pinned with a shimmery brooch or jeweled pin. 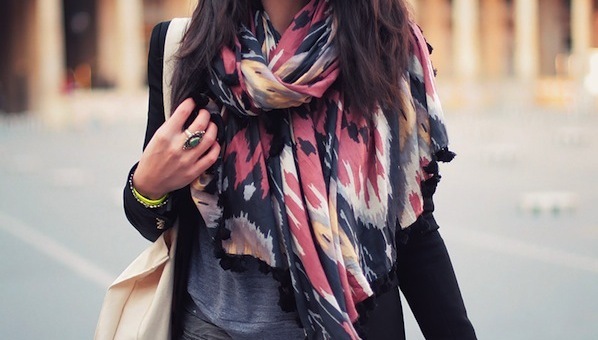 Your bulky scarf can still be cute! If your favorite part of winter is staying warm, then you definitely have a stockpile of scarves to keep your neck and ears warm. As you're choosing your winter scarf, scale it to your body size. If you're petite, you can easily be overwhelmed by extremely large or fluffy scarves. Curvier body types may opt for thicker knits and pull off the look extremely well. Feel free to match a printed scarf with your printed jacket if they're both neutral in color. The prints can be completely different as long as they have a neutral color in common. A Discountrue coupon for Christopher and Banks can help you add to your collection without breaking the bank. A good quality pashmina is silk mixed with cashmere wool. Pashminas are incredibly soft and silky, but good for both daily and cold weather wear. Consider these a combination of a scarf and a poncho. Depending on the size you purchase, they can be wrapped around just your neck or they can go all the way around your shoulders. Scarves do so much more than keep you warm. They instantly put together any outfit you're wearing while pulling double duty as fashionable outerwear.